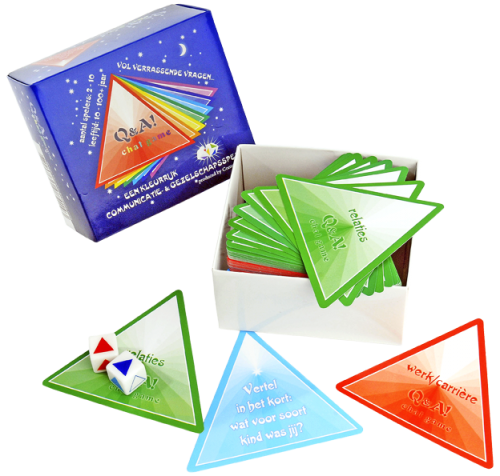 Place the triangle shaped cards in 7 piles, color by color, in the centre of the table. Shuffle the cards by category and place them with the category name upwards. The 7 categories are: Work/career (red), Activities/hobbies (orange), Physical/looks (yellow), Relationships (green), General (light blue), Opinion (dark blue) and Mental/inner world (violet). Take turns rolling the dice. The color combination that you roll, determines which card color you have to draw or whether you have to skip a turn (see also: explanation dice). Take the top card of the pile of cards and answer the question. The cards you have drawn are to be laid out in front of you. The first one to collect all 7 card colors (all the colors of the rainbow) wins! If you roll 2 colors, choose one of the 2 card categories corresponding with these colors. Of course you should choose one of the card colors you don’t have yet, in order to be the first one to complete the rainbow. If you roll 2 colors which you already have, you still have to choose one of these cards and answer the question. If you roll 1 color and 1 white, take the top card of the category that belongs to the color and answer the question. If you roll 2 white, skip a turn. If you roll 1 color and Q&A (joker), take the top card of this color/category. After you have answered the question, the other players in the group also have to answer this question (you keep the card yourself). If you roll white and Q&A (joker), choose a color/category (of course you choose a category you don’t have yet!). After you’ve answered, the others also have to answer this question (you keep the card yourself). Each color/category has 1 Q&A joker card. If you draw this card, you immediately draw the next card of the same category and pass this question on to another person whom you’d like to know the answer from (you only pass on the question, you keep the cards yourself). Answers can be short or long. Sometimes a short answer will do, while another time someone will give an extensive answer and/or other players will react spontaneously. As a result, the course of Q&A chat game is totally unpredictable. The answers someone gives vary and change according to the feeling of the moment, the group of players or recent experiences. It’s also unpredictable who will finally win the game, because the one who’s leading with 5 or 6 colors might still lose in the last phase of the game, being forced to draw colors he/she already has or having to skip a few turns. This way Q&A chat game stays exciting and full of surprises from the first to the last moment. If you’d play with a large group and run out of cards before there is a winner, keep 1 of each cardcolor, add the other cards to the pile and reshuffle. In case you then draw a card you already answered, simply draw the next one.